I've seen this question a lot, "how do I use a .jpg as a material in Bryce?" The answer is, "you don't." 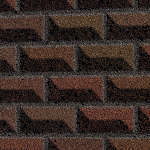 Pictures are used as texture components in Bryce materials. They can provide the coloring, bump, or "value" of any channel seen in the material lab. And the other channels don't have to come from the picture, they can be assigned globally or come from a procedural texture or another picture. I started out with these three images, each in its own separate file. As a mac user, I worked with these images in pict format, not in the form displayed here. 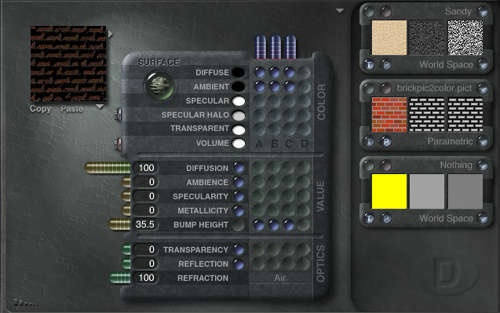 Note that each picture can be used to drive any material attribute in the material lab. 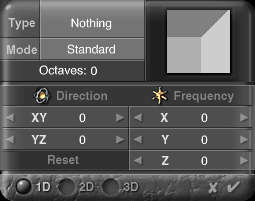 The phrase "alpha channel" refers to a fourth channel (in addition to the Red, Green and Blue channels) which can contain masking or bump information. It is a rare case when what works for the bump also works for the mask and vice versa! A procedural texture can have alpha and bump that are different from each other. In a pict texture, it's best to think of bump as a special kind of alpha. That's why the three pictures above have to be in at least two different files - commonly, one file containing the color and alpha information, and a separate bump file. For this discussion, it's easiest to assume the three images are in three different files. Since the goal is to use the picts in your materials, go into the material lab. Click any attribute in the A column and a random texture swatch appears at top right. 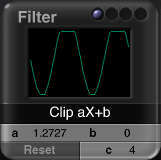 Click button #1 to change texture source A from a procedural texture to a 2d pict texture. Click button #2 to access the 2d pict library. Once in the 2d pict library, click an empty small square to load in the color pict. Then click on 'load' for the center square and load either the alpha or bump picts. Click the next empty square and similarly load the color pict with the bump or alpha you didn't pick last time. Once you've got a couple permutations of the 3 files put into the 2d pict library, you'll be able to get at them in the material lab during the current session. Back in the material lab (after you have accepted a pict in the 2d pict library), clicking button #3 brings up the shallow texture editor. It is also called the "golden tools." For pict textures, the one that concerns us most is scaling, the top tool, the numeric output is in percent, and for a freshly-selected pict, it always reverts to 0. Remember this when you've been perusing the 2d pict library and grabbed something new. As an example, if the pict you've chosen to work with is the default Leo pic, the default scaling of 0% will cover a 2d face with one Leo image. Taking the scaling up to 20% on each axis will cover the same 2d face with a grid of Leo figures, 16 whole ones and the arms and legs of many others. This is how you make your bricks smaller. 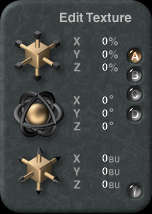 If you've read many of my tutorials, you know I'm a big fan of ABC mode in the Material Lab. I've made a new texture that I use in ABC blends a lot lately, it's called Nothing. Nothing is just what it sounds like, a procedural texture with Nothing as the noise. It should go without saying that Nothing also has no phase. Nothing does have a filter, though. It's the clip filter, and with it, I can make the alpha output of Nothing be anywhere from solid black to pure white or any shade of grey in between. What Does Nothing Have to do with Picts? 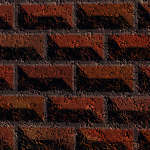 Here are three different materials I made using the color and bump brick images and ABC mode in the Material Lab to combine those colors and bumps with a procedural texture. At the bottom of the page is what the Material Lab looked like for the Sandy Bricks material. A small bug -- the nano-preview of the material has the bump inverted... The power here lies in that simply changing the filter on the Nothing in channel C changes how much color and/or bump information taken from the picture and how much is taken from the procedural A component. 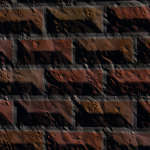 The Autumn Brick material above uses a "real" procedural texture in the C channel, not just Nothing. That's how some bricks can appear to be rougher than others.